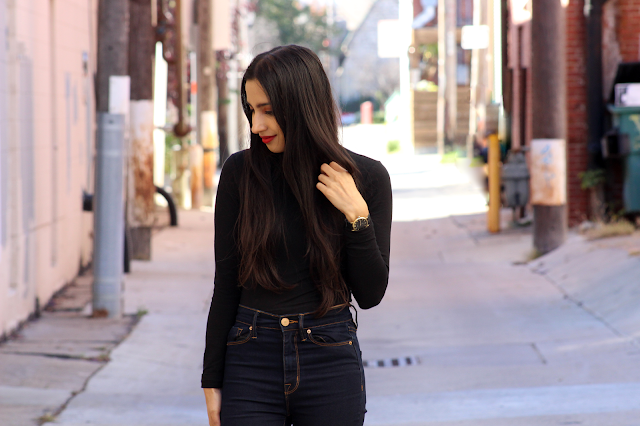 A black turtleneck and high waisted denim have been my favorite everyday look lately. Along with chelsea boots. This cropped turtleneck is from Forever 21 ($7.90), its super comfy, and 100% cotton. I love wearing this turtleneck with bright a red lipstick (Gwen Stefani inspired, of course). I hope everyone is enjoying a beautiful, crisp November. I'm powering through my senior year of university, practicing lots of yoga (working on my big toe pose), learning calligraphy, and excited for fall break! Love how you styled that turtleneck! It will be such a versatile piece this winter! I love the look of turtlenecks layered under dresses or overalls this time of year. Thank you Jamie! I agree I have so many other pieces it can go underneath and work well with! You look very gorgeous! I'm loving the look! I've always loved turtlenecks but it is usually too hot in my country to wear one. Thanks Gretchen! Aww that makes me sad, maybe you can try the short sleeve/sleeveless ones? it is one of the chicest i agree! u look fab! You look amazing! It's such a simple but chic look. Happy Friday! Nailed it! 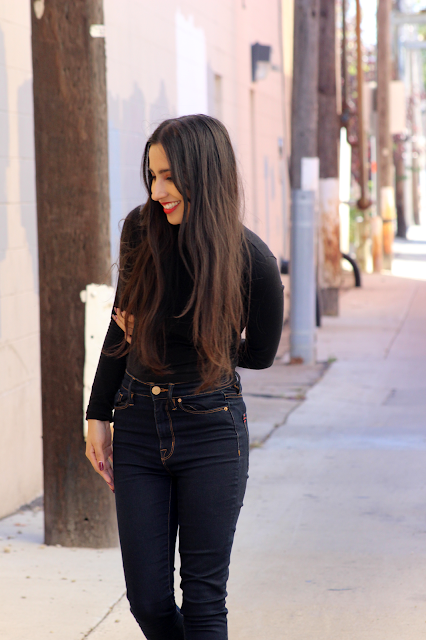 Black turtleneck and high waist jeans is timeless. Love this look. 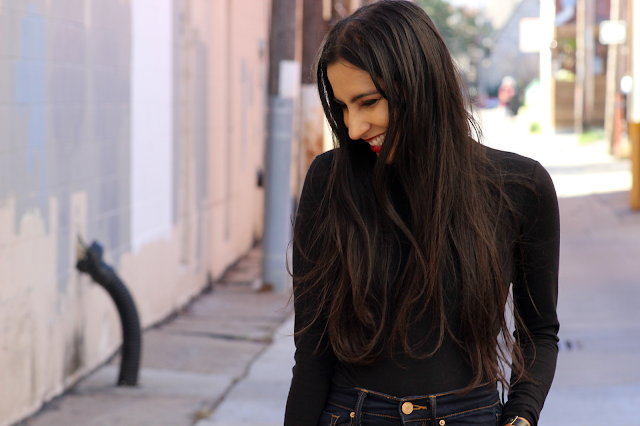 I love monochrome turtlenecks in fall/winter! and your boots are just fab! Calligraphy, how fun!! I love this sleek, simple look Sonia, you look gorgeous and sophisticated! Senior year... so exciting! 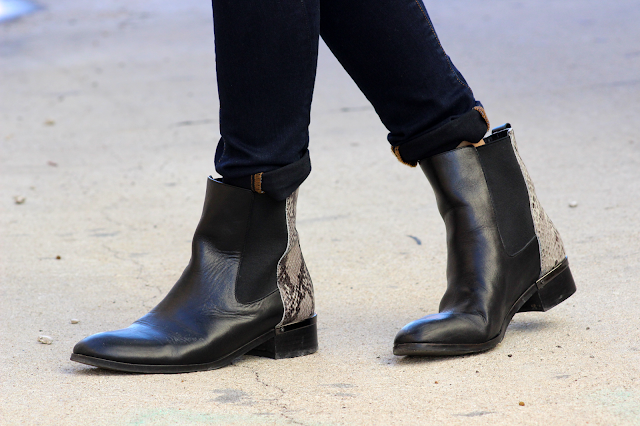 Those boots are so chic! Love the snakeskin back panel. And I'd totally pair this with a black top too. Aww thanks Yasmin! They're so fun, kinda wish there was a bit of gold o them, but love it still! You can't go wrong with a good turtle neck, I also love your nails. I love your black turtleneck, it looks so great! Yoga is great, it challenges my patience all the time. You look really nice. I like you nail art too, so cute. So much patience Sauniya! I'm at the point where I can block out the excess and focus on my practices which is so nice. Aww thanks! You look adorable dearie, your outfit, hair and nail, so cute. You look so incredibly chic, girlie! I adore this entire outfit; I'm quite obsessed with turtlenecks myself, they're so warm and stylish. I'm also adoring your red lip and nails, too! Thanks so much for sharing, gorgeous, and I hope you have the most amazing week ahead! You look great here, lady! Awesome denim! Absolutely adore this look. So lovely. I love the look! The black turtleneck is so chic and sleek and looks fab with the red lip and your hair :) Good luck with your senior year! Gosh, I wish I'm as slim as you are! I have been loving turtleneck tops too and actually just worn one to work today. You look absolutely gorgeous! and I love your boots! You look so chic and amazing in this outfit, we love turtlenecks and those boots are the perfect addition to this look!